Did you know that these ceramics were once considered high-tech? Through years of research and practice, the Chinese developed secret techniques no one else knew about. People from all over the world wanted these wonderful treasures. Come visit the showroom of the Jingdezhen Ceramic Works with Mr. Peters and Mr. Yi. Mr. Yi, a Chinese porcelain merchant, and Mr. Peters, an English merchant, meet at the British East India Company offices to look at porcelains manufactured by the Jingdezhen Ceramic Works. Mr. Yi: It is an honor to show you the porcelain manufactured by the Jingdezhen Ceramic Works. We think you’ll be very interested in what you see. We can fill any order, great or small, for your merchants at home in England. We can even paint them with the decorations your people want the most. Why, just a few years ago, we helped fill an order from the imperial palace for nearly 175,000 pieces of porcelain. Mr. Peters: How is this possible? Mr. Yi: We have special techniques that allow us to make many plates, tea cups, saucers, vases, bowls, and pots in one day, almost all of them of the finest quality. There are many steps in making a simple ceramic bowl, for example, and the people who make them each have special jobs. As many as 70 people may have helped produce the tea caddies you see here, from mining the clay, shaping them, firing them, painting them, and packing them for shipping. Mr. Peters: How do you make these porcelains? Mr. Yi: Ah, I’m afraid I can’t let you in on these secrets. What I can tell you is that near the city of Jingdezhen we mine a special clay needed to make the finest porcelain and mix it with a powder ground from a secret stone. In the forests around us we have wood to fire our kilns, and we have the Chang River to carry our finished goods to markets all over the world. Our ancestors discovered many secrets that make our ceramics more beautiful and innovative than those found anywhere else in the world. For hundreds of years, merchants have traveled to China to sell their goods and buy our porcelain. These simple white bowls were very popular in the Middle East and may have been made as early as AD 900. Bowls like these traveled by boat to Persia, Baghdad, and Arabia. 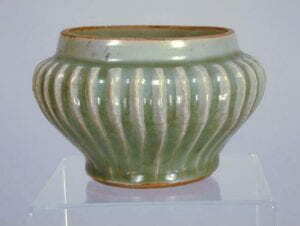 A favorite style of ceramic glaze in Korea and Japan is called celadon. Celadon is a European word that describes the beautiful color of this glaze—shades of green like bird’s eggs or gray ash or sea foam. 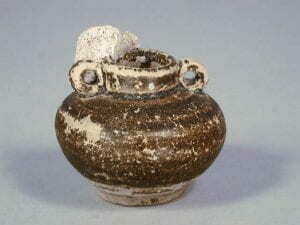 Speaking of the sea, ceramics are traded and carried throughout Asia by ship. This is a pot that sank along with a ship and its crew in the ocean off Thailand. See how it’s encrusted with some strange growth from the sea? Mr. Yi: During the time of the Yuan dynasty [visit Chinese Dynasties] we began to paint decorations on our porcelain before it was glazed. 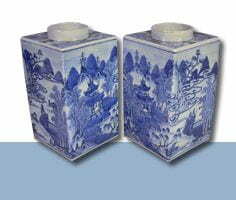 Most famous is the blue and white painted porcelain—the blue comes from the mineral cobalt. 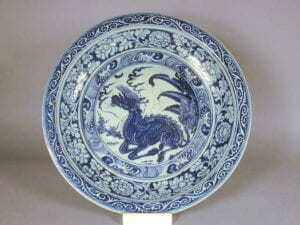 At first, most of the blue and white porcelain was exported to the Middle East. However, during the time of the Ming dynasty and our own Qing dynasty, it became very popular here in China and even in Europe—in fact, blue and white porcelain is popular anywhere there are people who can afford to buy these fine items. Mr. Peters: Would we be able to see your kilns? Mr. Yi: No, I’m sorry I cannot allow you to visit the kilns to see how the porcelain is made. I know you would like to see our wonderful country, but it is our emperor’s wish that all foreigners stay in the city of Canton. However, I can show you paintings of how we make our porcelains. Mr. Peters: I would like that very much. Mr. Yi: First workmen dig the clay. Some of the very finest clay comes from the Gaoling Mountains in the southeast, a very scenic part of China. Everyone helps: A woman and a child pack clay in barrels so it can be carried to the ceramic works. After the clay is specially treated with secret ingredients…. Mr. Peters: What secret ingredients? Mr. Yi: You know I can’t tell you that, Mr. Peters. Now, as I was saying, once the clay has been specially prepared, the potter can begin his work. See the potter shaping the bowl on the potter’s wheel? He shapes the bowl with his hands and turns the wheel with his foot. Mr. Peters: Did he make all of those bowls drying overhead and those bowls that the workman is carrying away? Is that all he does—shape the bowls? Mr. Yi: Yes, that is all he does. He studied for many years with a master craftsman, and now he is a master himself. Mr. Peters: Doesn’t he get bored? Our potters make most of a whole beer mug or vase or bowl from start to finish—starting with a lump of clay and working on each step until it has been fired. But look how many pieces your workman can make—and how fine the quality is. We have much to learn from you. Mr. Yi: Yes, I am sure there is much we have to learn from you also. Now here, in a peaceful pavilion by a mountain lake, craftsmen paint patterns on porcelain as a workman delivers more vessels for decoration. And finally, after the porcelain has been painted, glazed, and fired in the kilns, the finished pieces are packed in barrels to be shipped to Canton, to Japan, even to your home in England. Now, you can see how many pieces are made-see the stacks and stacks of bowls? This is what they look like after they come out of the kiln. When they are fired, they are separated by clay dividers so they won’t stick together. As you know, the kiln fires heat the clay so that it becomes very strong and hard. And see the kilns’ burning fires? When there is a big order to be filled, the fires of the kilns burn day and night. Mr. Peters: Now this is an unusual plate. Mr. Yi: Oh, it’s not so unusual. We paint designs that the customers order or that we think they will want to buy. 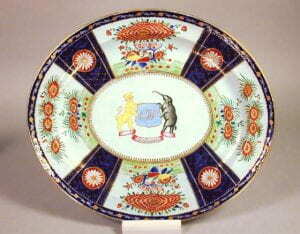 This plate shows a European gentlemen on the left and his young servant on the right. Mr. Peters: I can see that. But what are they doing? Mr. Yi: Mr. Peters, we do not always understand European customs. I had hoped that you could tell me. Mr. Peters: Now Mr. Yi, here’s something your craftsmen can learn from ours—how to paint people so that they look real. Why, we have painters who can create paintings so real you think they are going to talk! These don’t look like real people at all. Mr. Yi: Our artists are not interested in copying nature. They would rather be part of carrying on a tradition than fooling nature. Painting people this way is part of our tradition. Mr. Peters: Well, these two men are strange to me too. They must be from the colonies. But I understand this other colorful platter with the coat of arms. Is it for the governor of the Dutch islands of Malacca in Indonesia? Mr. Yi: You are exactly right! We make much of the china used by the greatest families of the greatest lands all over the world! A set of china like this might have more than 200 separate pieces in it: plates, platters, cups, saucers, and dishes for foods I have never eaten (and hope I never eat!). You name it, we make it. Mr. Peters: This interests me very much. I think I will be able to sell many pieces of your special china at home in England and in our colonies. Mr. Yi: We could even paint your portrait! Mr. Peters: That is flattering, but no, thank you. I do not want to look as strange as these two gentlemen here. But perhaps a special portrait of our good King George III will be a top seller. Mr. Peters: We appreciate your hospitality in allowing us to live and work here in Canton. Of course, we would like to see the rest of China—the scenes on your porcelain are so beautiful that we’d like to see them for ourselves. Our wealthy lords and ladies want china and more china. We want them to buy it from good English merchants, and not from our competitors, the Dutch and the French. I understand a Dutch ship just sank with 150,000 pieces of porcelain, including 63,623 tea cups with saucers. And, as you know, drinking tea is very popular in England, as well as in our colonies in North America, and tea will also be on board our ship. Not only are we interested in tea cups and tea pots, but we would also like tea caddies. We will use them to store our tea. 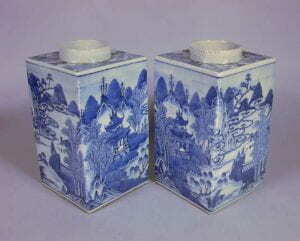 They are very lovely and the exotic pagoda pattern is fit for a queen. What do the designs mean? 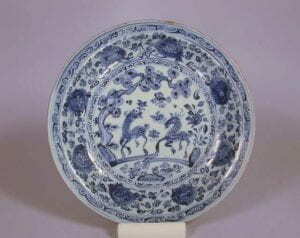 Mr. Yi: Many of the designs you see on these porcelain pieces [click on any image for larger view] symbolize long life—the pine trees on the tea caddies, for example, or the deer on the large plate to the left. The boys playing show a wish for male children. The strange horse-like animal below? That is a qilin, something like your western unicorn. It brings good luck. And I agree, these porcelains are very nice. We also make special porcelains for our emperor and his family, but alas, we cannot sell these imperial ceramics to you, even for the use of King George III. But more about that later. Now, how can I help you with your order?